Do you want a toilet that will give your bathroom a regal, traditional look? Are you on a budget and want to make sure that you’re getting one of the best toilets that is available today? With the Kohler Memoirs, you’re going to experience the best of both worlds! This toilet has the crisp, traditional lines that help to bring a level of timeless elegance into the design of a bathroom. It installs easily, even with the two-piece design, and is one of the most affordable toilets available right now. You’ll find it for less than $320 on Amazon right now! What Are the Features of the Kohler Memoirs? The primary feature of this particular toilet is Kohler’s inclusion of AquaPiston flushing technology. This is a patented system that allows gravity to do a lot of the work for flushing so that water is reduced, but cleanliness isn’t sacrificed. There is a lot less maintenance required for toilets that have this technology because the water rushes into the system and creates a powerful, circular motion that removes a lot of stuck on waste with just two pounds of pressure. Kohler has incorporated their Class Five technology into this toilet so that it has less of a chance of plugging up or springing a leak on you. The government standard for toilet water consumption today is 1.6 gallons per flush, but this toilet exceeds that with just 1.28 gallons used. This means that the average household can save up to 20% of the water they’d normally use for flushing every day and that is a cost savings that can definitely add up! Why Choose to Own the Kohler Memoirs? There are a number of advantages that come with this specific toilet, but it all boils down to form and functionality with the Kohler Memoirs. If you’re tired of a builder’s grade fixture in your bathroom and you want something that’s going to provide you with good, long-term results, then this is the toilet for you. It does sit away from the wall just a little bit and the flushing action is a little louder than you’d expect for a modern toilet, but overall it works hard to get the job done and that’s what ultimately matters. PS: You may want to check out the Best Kohler Toilets Review page as well! If there was one thing we’d change about the design of this particular toilet, it would be with the bowl design. The round bowl seems to keep waste items a little stuck over time, even with the good flushing mechanism, and that ultimately means a little more cleaning. The compact, sleek design overrides this issue in our eyes, however, and makes it a toilet that is worthy of a purchase. 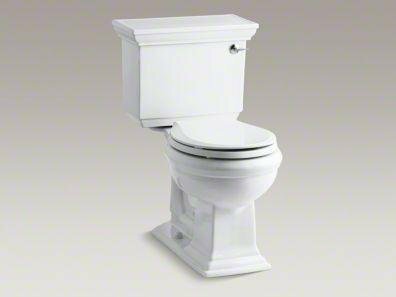 Click here to compare prices on Amazon and get the best price on the Kohler Memoirs Two Piece Toilet.